Steven (Chicagoland, United States) on 4 July 2017 in Miscellaneous and Portfolio. Best wishes to all my United States colleagues on this Fourth of July holiday! 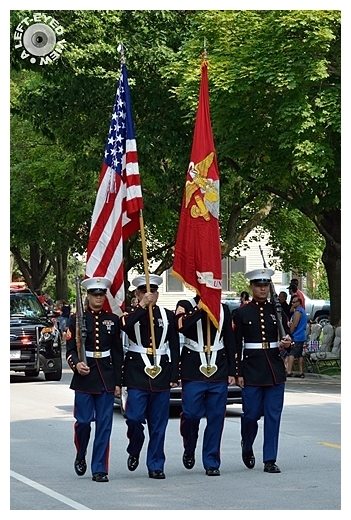 Marine cadets leading off the Fourth of July parade in Brookfield, Illinois. Photo captured July 4, 2015. Une très belle photo pour cette fête ! Très belle journée à toi !!! A superb image of the Cadets. Have a wonderful fourth of July Steven. I hope you have a spectacular holiday. And make many good photographs of the fireworks. Bonne fête et très belle image de ces cadets. A fine picture with which to celebrate the fourth. I hope you have a great day yourself. A good smart little group, well documented. Have a great Independence Day, my friend ! Excellent capture of the unit. Have a great July 4th! Happy Independence Day Steven ! Happy ID4! Can't wait to see the fireworks! Wonderful color! A great image for this day. Happy Independence Day Steven! Très beua jour important et quelle parade superbe. Heureux dêtre là surement !!! Happy 4th of July Steven (I realize I'm a full day late (I was stuck without a full day of blogging))... The one on the right (I assume) is the USMC flag right? @Sudipto: Correct! And all four cadets are Marines. Perfect photo.... Thank you Steven - I hope you and your family had an enjoyable holiday!